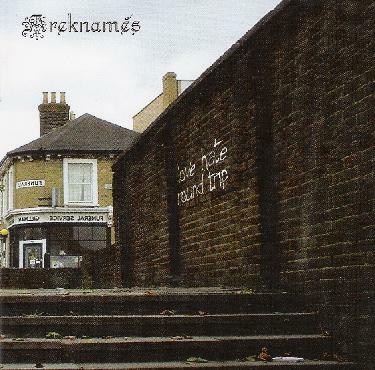 Areknames - "Love Hate Round Trip"
On their second album, Italian heavy prog ensemble Areknames offer up more of the dark and doomy brand of progressive rock that characterized their self-titled debut. The band is a quartet consisting of Michele Epifani on organ, synths, mellotron, piano and vocals, Piero Ranalli (ex-Insider) on bass, Stefano Colombi on guitars and Simone Antonini on drums. In classic prog tradition, Areknames songs take a number of thematic twists and turns, all the while showcasing truly stunning compositions and arrangements and HOT playing from all. Michele Epifani's vocals are very Peter Hammill influenced and really communicate the same kind of melodramatic intensity that Hammill did on the old Van der Graaf Generator albums. Standout tracks include the 10 minute "Deceit", which begins with a mellow buildup that sounds like Hammill singing with early Genesis. But then the music launches into full band mode, rolling over the listener with continually changing dynamics and narrative shifts. It's a mind boggling ride but the arrangements are seamless and fluid, and Areknames are so good at creating a sense of scene changing drama that you can't help but get sucked into the excitement of it all. "La Chambre" is another highlight, particularly the killer organ soloing while the band jam along behind it. Lots of great vintage keyboard sounds on this album. Hammond and Mellotron fans will have a feast! "Yet I Must Be Something" is one of the lighter songs on the album, having a dreamy and even spacey quality, yet never completely sacrificing the sense of menace that pervades throughout the album. At just over 11 minutes "Ignis Fatuus" is the longest track of the set, sounding at times like a metallic version of a song from VDGG's He to He or Pawn Hearts albums, and there's some jazzy sections that bring to mind King Crimson's In The Wake of Poseidon. And "Pendulum Arc" has some of the most ripping guitar work on the album and a monstrous fusion jam. Wow... very impressive. In summary, the pioneering days of progressive rock are much in evidence on this album, though Areknames are no mere retro band paying homage to their heroes. The compositions are as complex as prog gets, but at all times carefully thought out and arranged, and skillfully executed. They really play together as a BAND! Fans of heavy, intense Italian prog will be delighted. Someone needs to get these guys over to the US to perform at Nearfest or Progday. For more information you can visit the Areknames web site at: http://www.areknames.it. Hear Areknames at their Myspace site: http://www.myspace.com/areknames. Visit the Black Widow Records web site at: http://www.blackwidow.it.